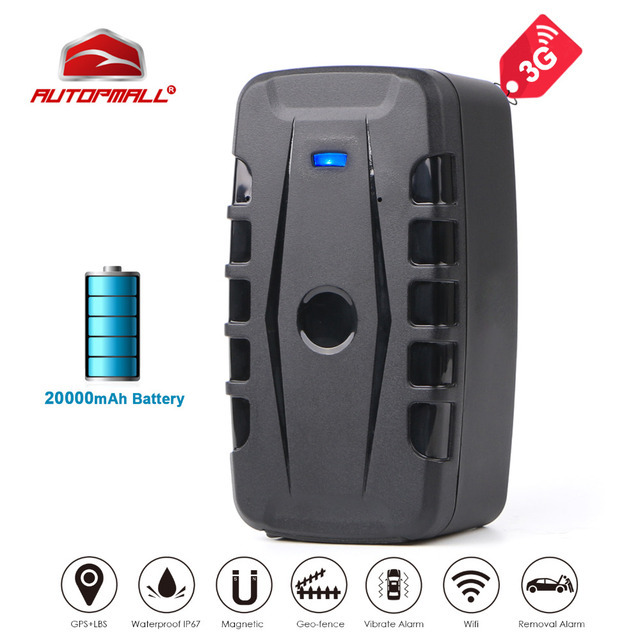 This Product LK209C is a Car GPS Tracker 3G version which is working based on the existing 3G WCDMA and 2G GSM network and GPS satellites, it can locate and monitor any targets remotely by SMS, mobile APP and web tracking software! It adopts the most advanced technology of GPS and LBS dual positioning. Besides, with built-in powerful magnet, it can be installed very easily and tightly on car, truck and any target with metal interface. What's more, it supports 3G WCDMA 850/900/1900/2100Mhz and 2G GSM 850/900/1800/1900Mhz, can work perfectly around the worldwide! 2. Realtime Tracking: You will can realtime track the device on google maps via mobilephone, tablet and computer, and the minumum data upload interval is 10 seconds! 3. History Route Playback: The APP and web server can record the upload data of the device up to 6 months, you will can playback the history route at any time! 5. Powerful Magnetic: It has built-in powerful magnets, can be very easily installed. 6. Waterproof IP67: The waterproof level of this device is IP67, it can resist splash water but can't be put under water! now if you make call to the SIM number in the device, it will pick up your call automatically and you will can monitor the voice around the device! 8. Overspeed Alarm: This alarm works only under continuous positioning mode.When the unit speed is exceed the speed you presetted, it will send message “speed alarm!” to the admin number every 5 minutes. 9. Shock Alarm: After you did the shake alarm setting,please keep the tracker being stationary for 5 minutes, then this function will start working. It will send SMS “sensor alarm!” to the admin number when the unit get shocked. 10. Movement Alarm: When the units stays immobile in a place for 10 minutes, the user can set up the movement alarm by this command "move+passord", then in case the device moved 500m it will send alarm SMS "Move Alarm+Latitude and longitude" to the authorized number. 11. Geo-fence: set up a geofence for the tracker to restrict its movements within a district. The unit will send alarm information to APP and web server when it goes out of or get in this district.